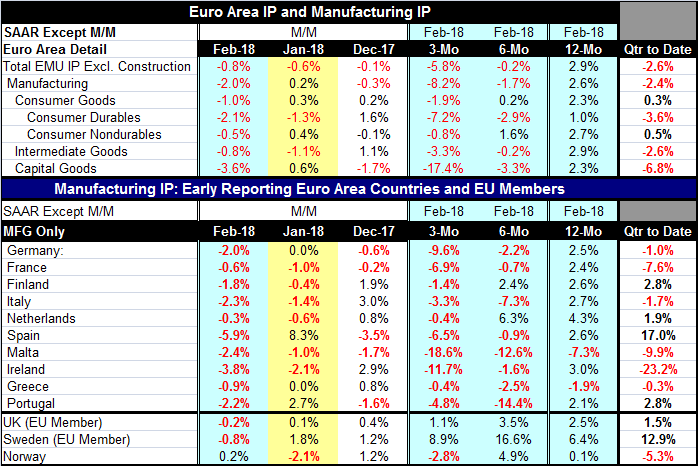 Euro Area IP Crashes and Burns for the Third Straight Month; Is It Still a Good Time for Central Bankers to Shift Gears? EMU industrial production has now fallen for three months in a row. Weakness is widespread and broad-based; it is severe in February, substantial over three months, and significant over six months. Output is falling on the quarter-to-date relatively, severely and broadly. So, hey, let’s tighten monetary policy! This episode of decline appears to be a bit more serious or problematic than it seemed a few months ago. Output had expanded strongly –at least in PMI terms and some backing off to a sustainable pace seemed a reasonable proposition. Maybe February is an example of ‘bad weather.’ But since output already fell in January (and ticked lower in December), that should have diminished any weather effect. I always remind people that you do not hurt yourself falling out of basement window. So if the economy had already slowed, there was not room for a weather impact to strike a decisive blow. Instead we have relatively severe declines of all sorts in train. This is beginning to look a bit more like a problem than simply like a slowdown or like a weather event. Safety in numbers or more risk? Having all the central banks backing off or talking about backing away from stimulus at the same time always has had the potential for generating a bigger cumulative impact. What should be lost on no one is that the relatively modest growth we have been obtaining has come in part with the support of all this monetary largesse. The speed up in U.S. spending in Q4 was a result of replacement spending boosted by insurance payouts because of hurricane destruction. Since then, U.S. retail sales have fallen for three months in a row; there has been sporadic weakness in European sales as well. PMIs are backing off. Asia has been slow to recover. There is precious little real evidence of a real growth speed-up. Economists see speed up in their econometric models although it might wind up in their models’ error terms. Year-over-year European output gains are still quite solid, however, showing a gain of 2.9%. Manufacturing is up at a 2.6% pace. Consumer goods output is gaining at a 2.3% annual rate, intermediate goods output advances at a 2.9% pace, and capital goods output expands at a 2.3% pace. The year-on-year pace is solid. But the quarter-to-date, three-month and six-month trends are worrisome. We have been previewing the key country results for manufacturing as they have been released, but we have the results now in mass. Of the original EMU members that we have in the table, all ten report output declines in February. Two of three other European countries also report declines. These are declines in countries from the Nordic region to the Mediterranean; thus, making it is unlikely that we are picking up a weather impact on all these data streams. In January output increased in only two of these ten nations. In December output fell in five of ten. Over three months output is falling in all ten countries. Over six months output is falling in all but two of them (Finland and the Netherlands). There are year-over-year decline only in the small economies of Malta and Greece. As we have seen, the PMI diffusion indexes have been generally stronger than the industrial production counterparts. For IP, we have data through February. But PMIs are up-to-date through March and continuing to ease. And there is the matter of the Baltic Dry Goods Index (BDGI), an indicator of world trade volume that rose briskly in the second half of 2017 when everyone was so happy about growth and growth prospects. But the index has since unwound most of those gains, falling sharply and steadily since the turn of the year and for most of 2018-to-date. Few want to talk about his. Some argue that there is some unspecified technical problem with the index. But we don’t know. On a trough-to-trough-to-trough basis, it is still rising. But the index has broken through the uptrend line that connects the previous two cycle lows. In some sense, the lower support level is broken and downward momentum based on the channel containing its ongoing fall is still in place. If the BDGI chart were for a bond, you would sell it. None of this is good. And we have seen very little impact from trade war fallout. Stock markets are nervous. There is anxiety about Syria and a pending promised missile strike to spank Assad for a chemical weapons attack. The oil market is upside down with Venezuelan oil off market and supply problems in Libya and Angola. Global oil supplies are more fragile even with fracking in the U.S. expanding apace because of raised tensions in the Middle East. In short, there is still a lot to worry about and the potential for news that could destabilize markets. And yet even before we have dealt with any of that we have data and trends in hand that are weakening without a clear cut reason why. Winter is a nasty time to vet economic data. The data are never as trustworthy because winter can be so much more disruptive than summer. Moreover, winter brings some important seasonal events as the December Christmas season gives way to New Year and after that to Chinese New Year and there are the important post-Christmas sales months including February which is the shortest month of the year and one with many holidays as well that further reduce the number of working days and make economic assessments more difficult. Still, we do the best we can. And right now that calls for being a bit less upbeat. While consumer confidence measures have been strong they have also stepped back and the wildly ebullient NFIB index in the U.S. took a large step back in March Apparently on concerns of possible trade war effects. A policy step too soon? I think the Fed and other central banks have breathed their sighs of relief about avoiding recession and deflation too soon and they have raised their hackles on inflation too soon as well. If you have been paying attention, you have seen this coming. The Germans bashed the ECB to reverse policy early in this cycle then inflation collapsed again and the Germans and Dutch have been strangely quiet for a while. In the U.S., despite its wandering around bleeding with a stake through its heart, the Phillips curve continues to be a reference for U.S. monetary policy and an alleged citation for rising inflation risk. But wages have actually softened in the U.S. services sector; there is some pressure in the (small) goods sector. Central bankers making forecasts and acting on their fears can be dangerous. In the just-released minutes from the Federal Reserve March 20-21 meeting, we see a discussion of how the Fed thinks; it believes it may need to change its statement language and may need to prepare for a higher than normal Fed funds rate not-too-far down the road. But the yield curve in the U.S. is already flattening with a vengeance. A speed up in tightening to reach a presumed ‘neutral’ fed funds mark near 3% sooner seems pure folly to me. The Fed would invert the yield curve and slip the economy into recession before it got there. But central bankers apparently don’t see things that way. I do not know how they see things; I think they fear things more than they see things. If their eyes are wide open, it’s hard to miss all the new negativity that’s afoot. Be nimble.